Two-time World Cup champion Brandi Chastain talks the fight for equality in women's sports, including the U.S. women's national soccer team's highly publicized wage discrimination lawsuit. The soccer legend also revisits her infamous game-winning goal in the 1999 World Cup final and weighs in on Rio 2016. What happened to Brandi Chastain's famous World Cup bra? Legendary soccer pro Brandi Chastain sits down with Larry to discuss equality for women in sports, what needs to change in the world of soccer, and the difficult disease that hits close to home. Plus, Chastain reveals where she keeps that iconic black bra and which Olympic award she carries around in her pocket. Larry and Brandi trade favorite players, best advice, and the Olympic moments that changed the game. “I get chills thinking about it,” says Chastain on the moment from the 1980 Olympics that inspired her to pursue a career as a professional athlete. Chastain also shares who she thinks is the most underrated soccer player of all time, her experiences in coaching men’s soccer, and how she made the tough decision to retire. "In sports I think, unlike a lot of other things, somebody else tells you when it's time. Sometimes your heart is still in it and your head is still in it, but, you know, the coaches get to make choices." – Brandi Chastain on retiring from professional soccer. “My first real memory of the Olympic Games was 1980, when the men's hockey team won the gold medal... so I was 12 years old, and I live in California so there was no reason for me to be interested in hockey, but there was something special about that team when they beat Russia in the semi-finals that drew my attention. And being a sports person, you know, even more attention. Then they won and all of a sudden it was Mike Eruzione, and Jim Craig, and Jack O'Callahan. And next thing you know I was swelling with pride and – I remember literally saying to myself, ‘I want to do that.’ It wasn't to play hockey, it was to wear that red white and blue. I wanted to celebrate on the podium. I mean I get chills thinking about it." – Brandi Chastain on her first memory of the Olympic Games. "We have a great luxury being female athletes in the world of sports because our country is progressive, more progressive than other countries about the participation and the acceptance of women in sport, even though we're still talking about equal pay… I think like most things – you’ve probably talked about it many times in politics too – you know, it’s changing people’s perception. Sometimes it’s cultural. Those things take time. You don’t turn those things around overnight, but I feel that we’re closer than we’ve ever been.” – Brandi Chastain on wage equality in for women in sports. "Never did I see myself ever winning the World Cup. And so when it happened, there's this rush of emotion and adrenaline and relief and joy that you can't, one, anticipate and you surely can't define. It just comes over you." – Brandi Chastain on how she felt after her game-winning penalty kick at the 1999 Women’s World Cup. “It's about pay, but I think it's about more than that, Larry, to be honest with you. I think its about the way U.S. Soccer and the rest of the world see women in sports, and in this case specifically soccer. I mean FIFA as a governing body for a long time have not been supportive of women's soccer, and still across the board need to do better to help countries in let's say Africa, or South America, or Asia, wherever it might be, to support women's soccer, for all the good that it will do from the grassroots level all the way up to the professional level. We represent soccer no differently than the men who play it." – Brandi Chastain on the U.S. women's team filing a lawsuit against the U.S. Soccer Federation. “It was love at first kick.” – Brandi Chastain on playing soccer as a young girl. "IBDGameplan.com is a great resource where people can locate gastroenterologists, they can get tips and tools to help find treatment and find therapies that work for them specifically." "Early detection is really important. That's why I think we're having this conversation. From my standpoint as the support and the caregiver of someone who has been diagnosed, what can I do now to help him? And how can I be supportive in a matter-of-fact way? This is a disease and a situation where it's uncomfortable for some people to talk about it." – Brandi Chastain on her son’s diagnosis with Crohn’s disease and spreading awareness about IBD. "My grandfather used to give me a dollar when I scored a goal, but a dollar-fifty when I made an assist. It was better to give than receive." 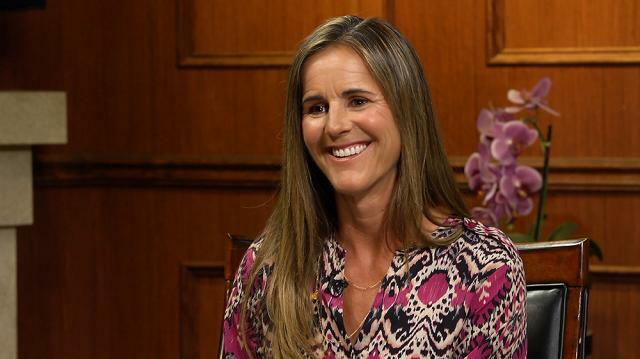 – Brandi Chastain on the best advice she's ever received. "I think the one reason, Larry, that we were really successful, and most teams are successful is because they really care about each other. We're friends more so than teammates." – Brandi Chastain on the 1999 Women’s National Team.